Fake News! Read all about it!! 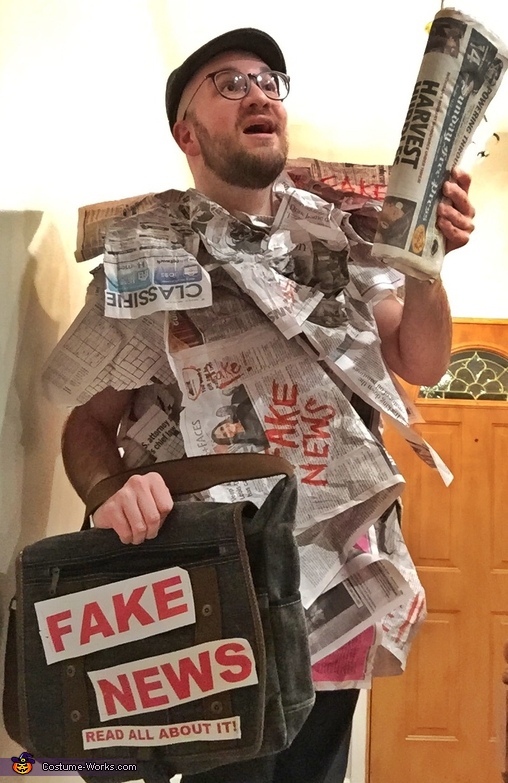 The costume is "Fake News." This idea came from a conversation my dad and I had in the car, and I told him I wanted to do something creative and related to 2017, something funny. I came up with Fake News! I used: Hot glue, news paper pages, a white shirt, messenger bag, red marker, newspaper boy cap, black pants (rolled up), tan socks, and black boots. 1. Glue all of the news paper crunched up onto a white shirt. 2. Make sure you really cover the shirt and leave parts hanging out. 3. Once dry, use the red marker and label "fake news" on headline titles, and draw whiskers or something funny on pictures. 4. Create labels for messenger bag saying "fake news, read all about it!" 5. Dress up in a newspaper boy outfit with boots, tan socks, black pants, and a cap! This costume held up super well, and got many laughs.